Forms Data Loader (FDL) is a tool to load data from Excel or CSV files into Oracle Apps 11i / R12 through front end forms. It provides an easy to use and cost effective solution for loading test or legacy data into Oracle E-Business Suite. Although it is specially built for loading data into Oracle to load data in any application Forms running under Windows like SAP and others. Requires no special technical knowledge and can be used by any non technical end users as data is loaded through front end. Comes with unique Paste and Auto Fill feature which makes copying of Data from Excel very easy. 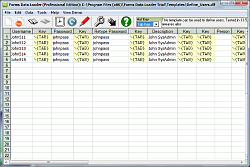 Supports Data verification while data is entered into forms. So no more errors while loading. erroneous information and you risk unpredictable results throughout Oracle Applications. do not keep a record of changes. modify Oracle Applications tables, unless we tell you to do so in our manuals. " Oracle does provide Open Interface tables but, it is tedious exercise to load data using Open interface tables. Our tools are useful as they load the data from Front End Forms as though entered by a user and thus all the validations are performed. 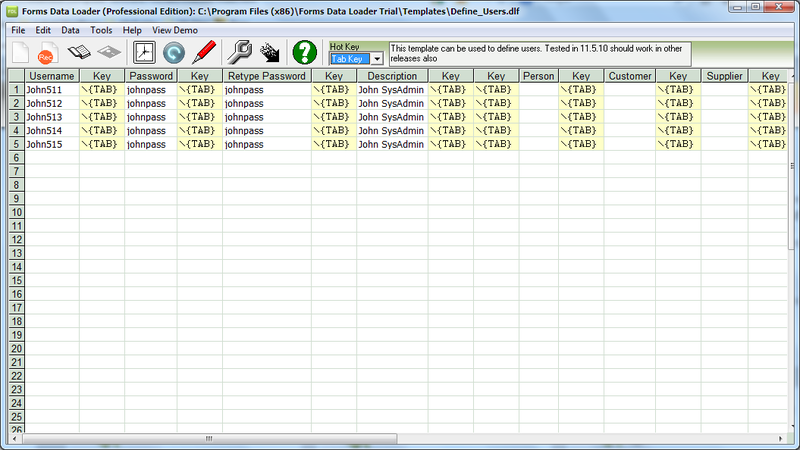 Using this feature Forms Data Loader can be used to load data accurately and several times faster than Macro Loading. It is more reliable, the load will stop whenever an error comes, It is because Oracle Forms will execute the load. You use Forms Data Loader just for developing the load. Using this method you can load the data in Oracle Apps by performing the following Steps. Run the Oracle Application Forms in record mode and enter 2 or more records in whichever form you want to load the data. Then Play the file saved in Step 2 by running Oracle Application Forms in Playback Mode. This method is accurate and handles all errors and nearly 10 times faster than macro loading.